Don’t be discouraged if you’ve been told that your home has a termite problem. There are plenty of poisons that you can buy over the counter to help kill or prevent termite infestations. All hope is not lost! We’ve put together this termite killer buying guide to help you choose one that will work best for your home. Before we get started, let’s look at some of the things you should know before you start shopping for termite killers. Application: This refers to how the killer is applied. Some termite killers are a lot like regular bug spray, while others are foam that expands into termite nests and crevices. There are even stakes you put around the perimeter! Concentrate: Mostly for liquid forms of poison, this means that you will have to mix it to be able to spray it. Usually, there is a formula that tells you how much product to mix with water. Control Time: How long will the product protect you? You may have to reapply as often as every 60 days, or sometimes not at all! It really depends on how the poison is delivered, and the individual formulas. Pet Safe: Is it safe for your pets to be in the same area? Some poisons will have adverse effects on your pets, so you need to make sure if you have animals that the product isn’t going to harm them. Package Size: How much product do you get? The size of the packaging determines how much you’re going to get and, usually, how much house it will cover and protect. Smaller packages are usually concentrated and will be mixed with water. Use Area: Some termite killers can be used indoors, though most are used outside-use only. Some can be used for both, so keep an eye on where you can use the product, or it will not be as effective. Now that you know what to look for, we can show you some of the products! Our termite killer reviews have been selected from tons of research and review, in order to bring you the best-working termite solutions on the market right now. Check out our top pick and budget pick first, before reading through the rest of our list. We’re sure that you’ll find the best poison to keep the termites away from your home! 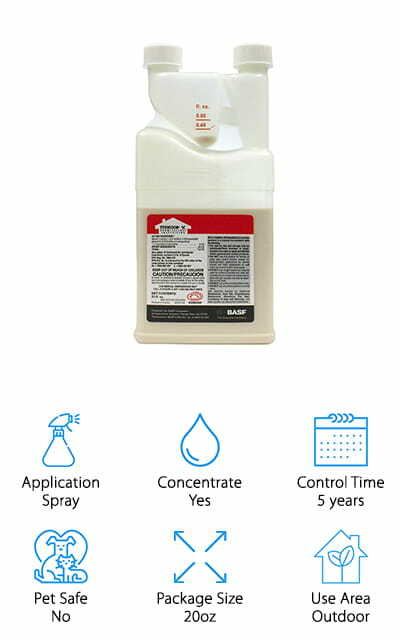 This BASF Termidor spray is concentrated, which means that it will make about 24 gallons of a solution that you can use to spray the areas with termite damage. The most effective use of this liquid, however, is in trenching. Trenching is one of the most effective termite treatments – where you plant the liquid and create a barrier. The 24 gallons of solution that this 20oz bottle will make covers about 60 feet of trenching. It works in three months or less to control termites, ants, roaches, silverfish, and spiders, even wasps! It’s not to be used as a knockdown product for wasps, however. This trenching system should be installed around the perimeter of the property you want to effect, and when combined with more fast-acting solutions, it’s one of the best termite killers for sale. There are tons of positive reviews about how much this product will work – you should definitely give it a try if you have a problem! Spectracide is back at it again, this time with one of the best cheap termite killers that you can buy! It’s foam that kills on contact. Because it’s a foam, it expands to about a 20:1 ratio to reach into the voids and cracks in your wood. Put it where you have termite damage or where they have built tunnels, and your termite problem will be quickly eliminated. Since it kills on contact, it also works to keep termites away from these areas and the places that they’ve already built and hollowed out. It comes out of the straw as a liquid and quickly expands as foam to wipe your problem out at the source! Don’t waste your time with other formulas that won’t work – Spectracide has shown that it’s a reliable brand over and over again. The special nozzle directs the spray where you need it the most to effectively wipe out your wood-eating pests. 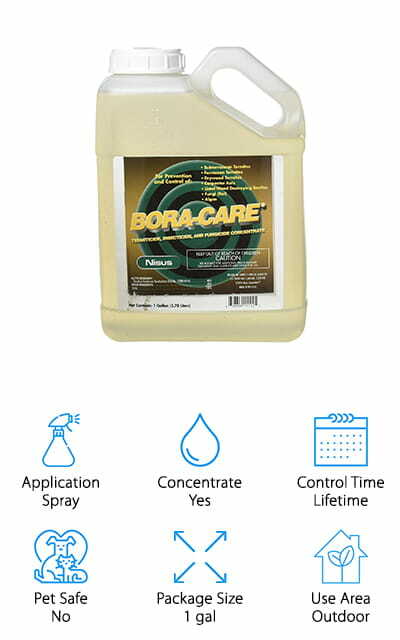 The Nisus Bora Care Control formula gives you a lifetime of protection against termites, carpenter ants, and other wood-destroying organisms. It easily penetrates the wood to help prevent the termites from eating your wood, no matter how persistent you are. You can apply this in multiple ways, including spraying it on the surface of the wood, or brushing or rolling it on. It will preserve the wood for a lifetime when used according to the directions. It’s one of the best termite killer products on our list for how quickly and effectively it works to protect your wood for a lifetime! It covers about 800 square feet of wood that you want to be protected, as well as killing your existing infestations of termites, carpenter ants, and other bugs that like to eat your wood. We love that it seals your wood against further infestations as well, so you don’t have to worry about reapplying no matter how much time passes. 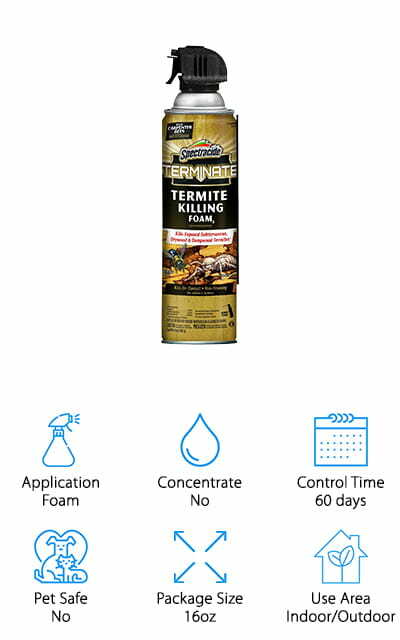 Precise Foam Termite spray is meant for use both indoors and outdoors, making it perfect for wherever your termites like to nest. You can use it inside crawl spaces, basements, and on damaged wood all around your home. This formula is foam, meaning that after it is applied as a liquid, it expands to an amazing 30:1 ratio. The foam will get into all of the cracks, nooks, and crannies in the affected wood to kill termites from the source and on contact. It’s non-repellent, meaning that the termites won’t know to stay away from it. This termite killer is a precisely-formulated dry foam instead of a wet foam. This allows it to expand faster. It will take about 72 hours for the foam to start getting rid of any existing infestations. Use it inside galleries or voids in the wall for the best results in getting rid of termites. We love how much this foam expands! 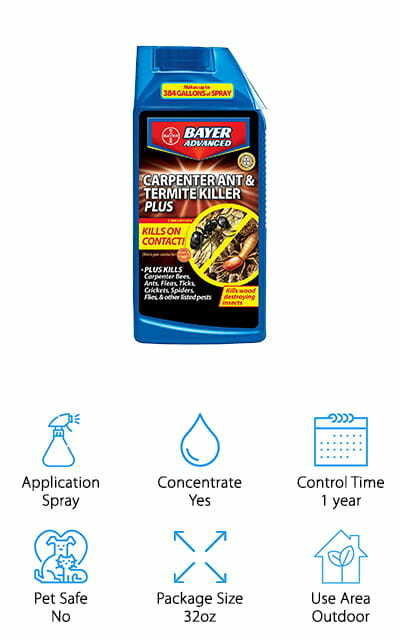 This Bayer termite killer is a concentrated formula in a 32-ounce package. It works well for a full year to control a variety of insect pests, including ones that are notoriously difficult to control or keep out of your house and property. It kills a wide range of flying and climbing insects that infest wood, specifically. You can use it just about anywhere outdoors, including landscaping, deck and patio, and wood piles. In a sprayer, mix this formula with the recommended amount of water in order to make the most effective combination. Use it once to spray the areas you want to be protected in the spring, and the termites and other insects will go away for a whole year. The residual protection offered by this product is great! It will even work to eliminate fleas and keep them away all year long. So many people have had really positive results with this product; there are some pretty solid positive reviews! This Spectracide anti-termite system is unique on our list because they are stakes instead of being a spray or a foam spray. You can install these handy stakes in just moments with the tool that Spectracide provides. It kills foraging termites and even helps you detect them. There are indicators on the stakes that pop- up when they detect termite activity, as well as easy-to-find locator shields which tell you where the termites are working together. You can easily inspect these to make sure that you don’t need to replace them. There are about 15 stakes in this kit, which includes the digging tool as well. You know how many stakes to buy based on the square footage on the outside of your house or the perimeter. If you have a larger house or yard, you might need to buy multiple kits in order to adequately protect your space. It’s never been easier to control termites! 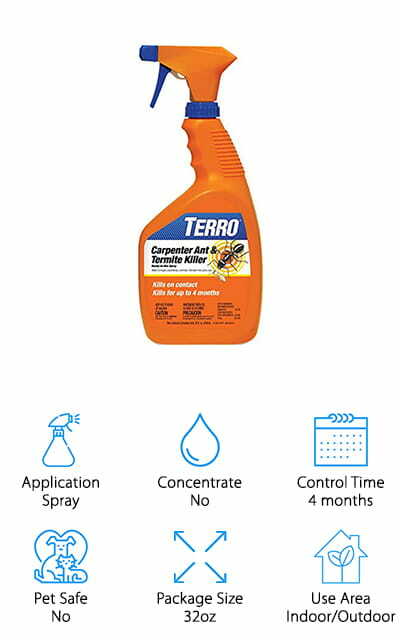 TERRO termite control formula also kills carpenter ants and other wood-eating pests on contact. That’s pretty amazing, all things considered. The residual activity kills any pests that might be trying to make their way in via a treated area. It lasts a long time, and there’s no hassle in reapplying it! 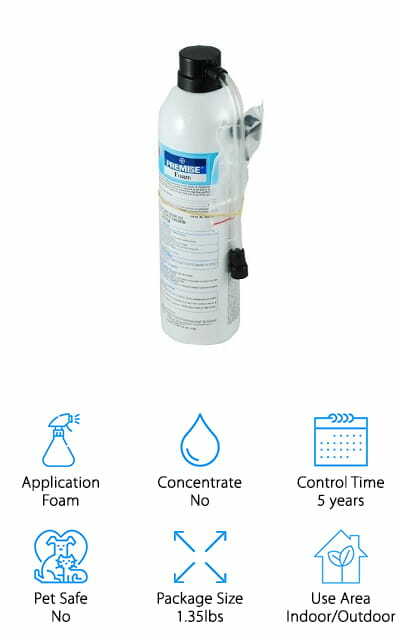 It comes in a ready-to-use trigger spray bottle, so there is no mixing and measuring required for this product. The termite killer chemicals are gentle enough to use in campers, attics, and even on your outside decks. It’s gentle on your wood and tough on the termites that want to destroy it. And it won’t stain, so you don’t have to worry about any discoloration. For best results, TERRO recommends that you apply it to the outside surfaces of buildings, as well as around ant trails and ant hills to get rid of the pests that you don’t want in your home. It’s super effective! This is one of the only natural termite killers on our list! Cedar Bug-Free Termiticide kills dry wood termites, carpenter ants, and a wide variety of other wood destroying pests. To do it, it works to penetrate deep into the wood you want to protect – even if that wood is painted, stained, or varnished. It dissolves eggs and larvae to make sure that the infestation is taken care of without giving it any more opportunity to spread. You can use it inside or outside. For best results, use it during the heat of the day – apply three coats with a sprayer or roller to all sides of the affected wood so it gets deep into the damage and the termite tunnels. It will dry quicker if you apply it during the hottest part of the day. The best part? 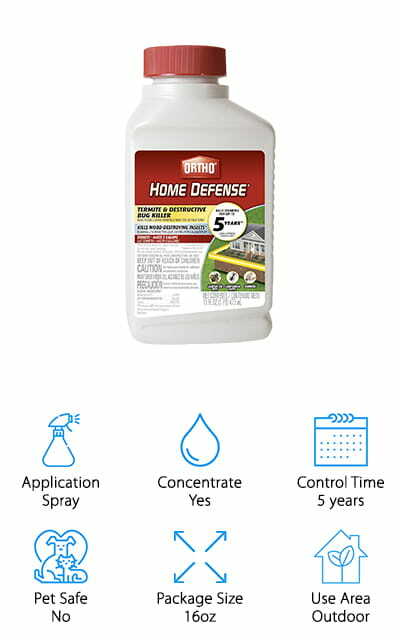 This Termiticide boasts that it will preserve the wood that you apply it to for life – so you never have to reapply. 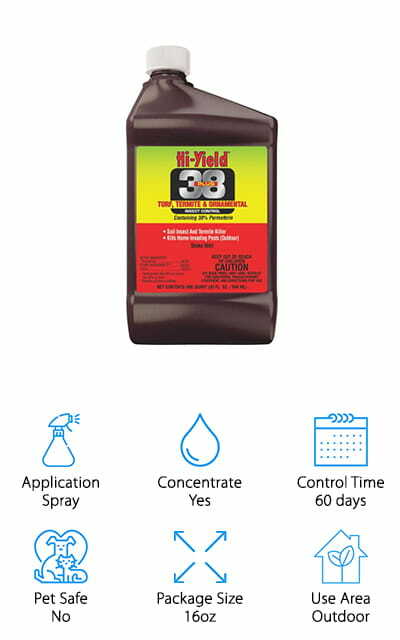 Hi-Yield Termite Control is a super effective, no-nonsense product that controls termites as well as borers, aphids, ants, roaches, and even spiders! Keep those home-invading insects outside where they belong. But you don’t want them on your lawn either, which is where this spray works even better. It’s a concentrated formula, and there are different water-poison mixture ratios for each type of insect that you want to keep away. If you have a roach problem, there’s going to be a different formula than to keep termites away – but a basic mixture will work for all of the different insects. 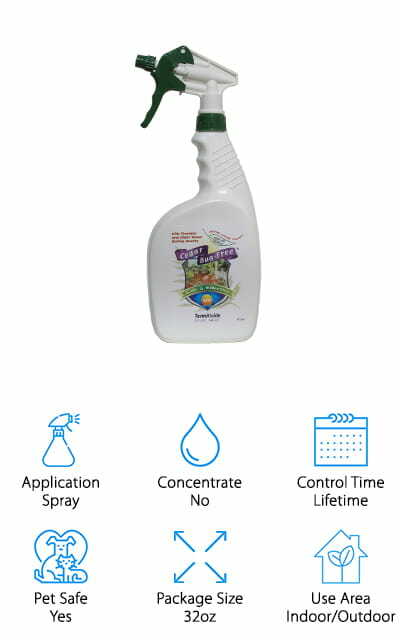 You will continue to use this as your only termite/insect control for years to come – they won’t come back with this termite killer spray. We love that it works so well to keep a variety of insects from affecting your home, lawn, and property. It’s also unique on our list for the control of borers and aphids as well. Ortho is one of the best-known names in controlling weeds, insects, and other pests that you don’t want invading your home, lawn, and life. 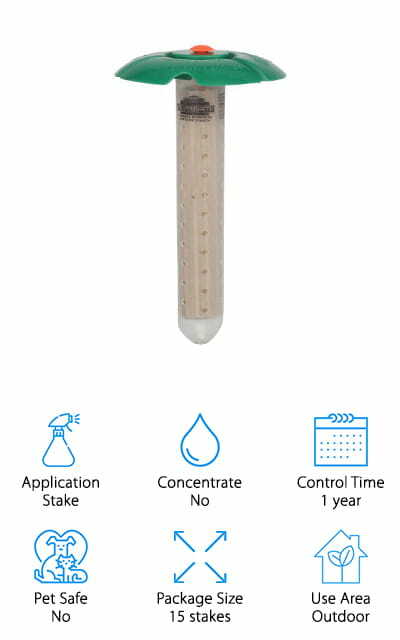 This particular product is an extremely concentrated termite and destructive insect killer. When it’s used as a trenching treatment, where it’s planted specifically in trenches around your property, it boasts that it will keep termites away for 5 full years. That’s pretty amazing! Spray it around your home’s foundation, on wooden structures, and it will work to keep away subterranean termites and carpenter ants. Mix in a sprayer with water, and this 16-ounce bottle will yield five gallons of spray! It’s an amazing value for that yield. If you have a smaller termite problem or a smaller property, this spray will last you for a long time. Even without using this spray as a trenching treatment, it will last for the season so you don’t have to worry about keeping it applied!